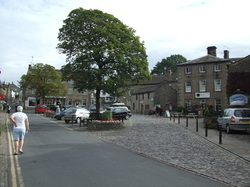 The route from Ilkley to Grassington follows the River Wharf through Wharfdale. After a few miles it's not long before you arrive at the village of Addington. The church has a beautiful stricking blue clockface. The history of the village can be traced as far back as the Neolithic early Bronze Age. 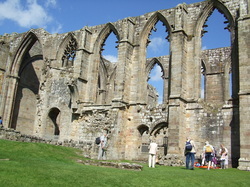 From Addington....... A few miles further on from Addington is the popular tourist spot of Bolton Abbey a 12th century Augustinian Abbey. There are plenty of things to do here including fishing, walking, picnics or even an afternoon tea. From Bolton Abbey The Dales Way continues over a footbridge or for those more adventurous some stepping stones! Gently climbing up through through Strid Wood you eventually come to The Strid. The Strid is where the River Wharf narrows and over a period of time has caused softer rock to wear away to form a series of pot holes. The Strid gets its name becase it's said to be a stride wide. It's not recommend to try jumping here as it's wider than it looks and the rocks can be slippy. The Craven Arms at Appletreewick is well worth a stop at. As well as good ale, behind the pub is the Cruck Barn that can be booked for special occasions. Finally you arrive at the village of Grassington via a road bridge. I stopped at Craiglands Guest House in Threshfield approximately *** yards turning left up the road from the bridge, a guest house I would highly recommend. 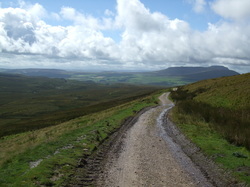 This was quite a short section of The Dales Way. Returning to the road bridge you continue onto the lovely village of Grassington. Turn left through the market* place and up the hill. 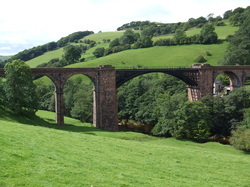 From Grassington you will leave The River Wharf and climb our of Wharfdale* to a series of limestone strewn fields. Eventually you drop down until you reach the village of Kettlewell. Add link to coffee shop here* (add to links also). Once again you rejoin The River Wharf (i think*) and follow the river past Starbottom* until you finally reach the village of Buckden. I stopped at a beautiful guest house called Hartrigg House* where my host kindly booked me a table at **** for my evening meal. 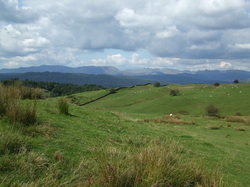 Cam Houses, Three Peaks, Ribbledale Viaduct, Change in scenery.